Borrowing the words of New York Times architecture critic Michael Kimmelman who wrote that "public space is more important than social media" when discussing this summer's turmoil in Taksim Square, we hope to highlight the huge potential that lies in designing interactive interventions for public spaces. 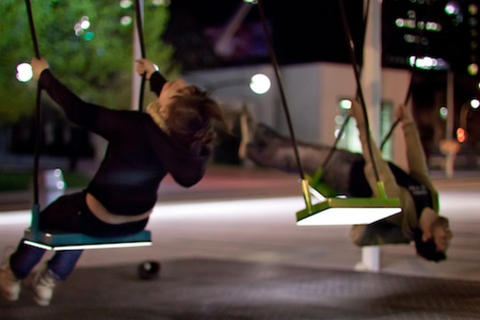 Numerous projects around the world have been exploring the potential of playful and surprising interventions to re-enchant urban settings and invite people to re-connect with each other and their surroundings. Classic interaction design strategies, when applied to physical space, can help bring magic in everyday behaviours and places, and ignite in people a sense that together we can achieve more than alone. From lessons learned as principals of the Montreal based design studio Daily tous les jours, we will present research in designing collective experiences that can spark conversation between strangers in public spaces and ultimately create new rituals for communities. Melissa is a designer, strategist, storyteller and co-founder of design studio Daily tous les jours. While embracing opportunities that new media offer, her approach focuses on participation and narrative. She was awarded the Montreal Phyllis Lambert Design Award along with her co-founder Mouna Andraos. Their work recently won Best in Show at the 2013 IxDA Awards. Before founding Daily tous les jours, Melissa worked on a series of public interactive installations for London’s Royal Festival Hall, which led to her selection by Wallpaper* magazine as one of the world’s ten breakthrough designers. Melissa Mongiat holds an MA with distinction in Creative Practice for Narrative Environments from Central Saint Martins College, London, and a BA in Graphic Design from the Université du Québec à Montréal (UQAM). Melissa Mongiat now teaches at UQAM's École de Design. Considering technology as a vehicle for social change, Mouna's work has been geared towards demystifying and disseminating technology. In 2010, Mouna co-founded Daily tous les jours, an interaction design studio with a focus on public participation. She was awarded the Montreal Phyllis Lambert Design Award along with her co-founder Melissa Mongiat. Their work recently won Best in Show at the 2013 IxDA Awards. Prior to founding Daily tous les jours, Mouna worked under the label Electronic Crafts exploring the intersection of mass-produced electronics and handmade crafts. Her web-based work for Montréal interactive agency Bluesponge won prizes from Communication Arts, Webby, Best of Show at SXSW and a CyberLion in Cannes. Mouna holds a Masters from New York University's Interactive Telecommunications Program (ITP), a Bachelors degree from Concordia University and is an alumni of Eyebeam Center for Art and Technology. She currently teaches at Concordia and UQAM’s École de Design.